Drawn from left to right, a decision tree has only splitting paths but no converging paths. A decision tree is consists of the following elements. A Decision Node is a node which represents a decision needs to be made. A decision node can contain many "Action" nodes. An action node represents an action that a decision maker can take. With some action nodes, A decision node can be shown like this. 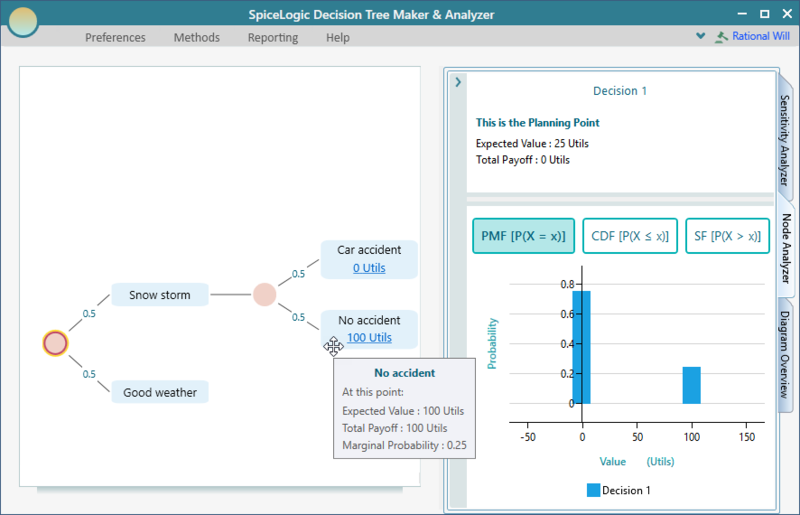 In Decision Tree Software, you can create a Decision tree with a Decision Node as the root node by clicking the Decision button from the start screen as shown below. 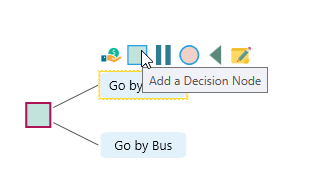 A Decision node can be added to an Action or an event node as well. We will introduce the event node type in this documentation page. 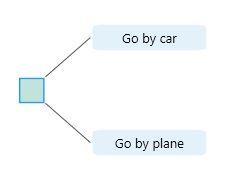 Decision Tree software shows a flyover menu when a node is selected within a tree. The flyover menu shows only the valid children types that can be added to that node. For example, a decision node can contain only the Action node. But an Action node can contain one Decision Node or one Chance node. Here is an example screenshot showing a flyover menu for a decision node. So, the tooltips on the flyover menu button will explain the function of that button. 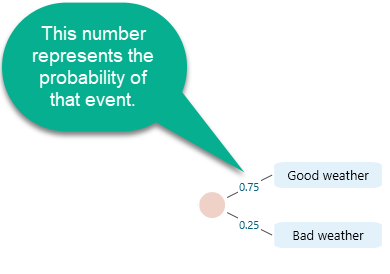 A chance node represents uncertainty. It is a random variable that can have several states, also known as events. Chance node is represented by a Circle as shown below. The flyover menu (when selected), a Chance node shows options to add Events as shown below. You can add a chance node on any Action Node or Event an Event node from the flyover menu as shown below. In order to use the Chance node as a Root node, you can click the "Chance node" button from the Start page as shown below. 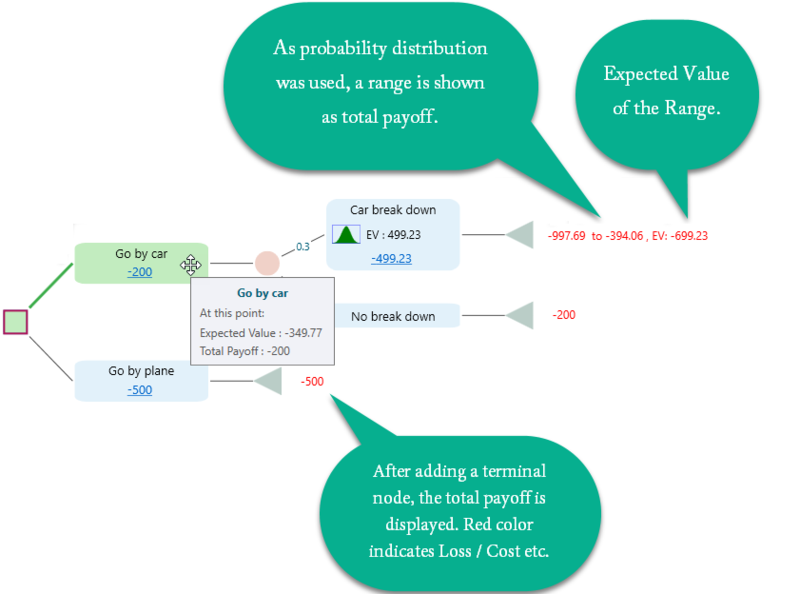 In the Decision Tree software, you can easily convert a decision node to a chance node and a chance node to the decision node. 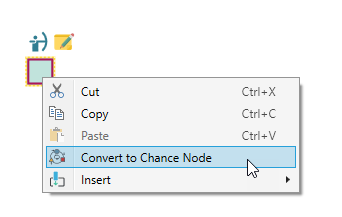 So, if you have created a Decision node as the root node, you can simply right-click on that Decision node and choose the option "Convert to Chance node" from the context menu. The payoff can be profit, cost, distance, time or any other measure based on your objective. A payoff can be a subjective value too. An action node and an event node can contain a Payoff value. Once selected, you can see the following flyover menu button for adding a payoff to the node. Once you click the Payoff button, you will be asked to model your objectives if you did not do so already. 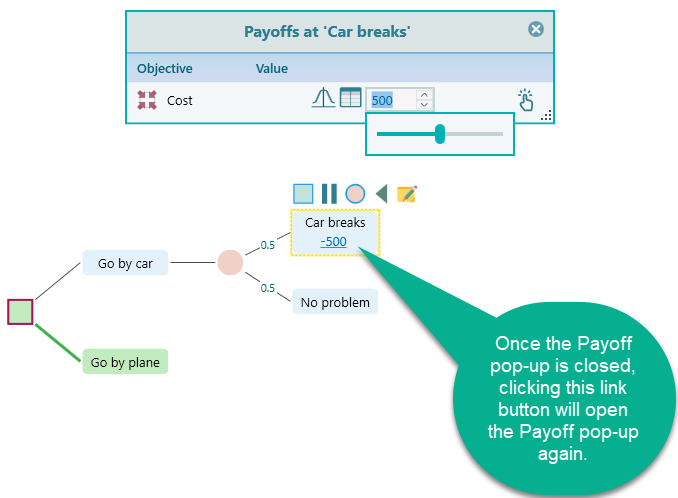 Once your objectives are modeled, the Payoff popup will be displayed on the node. You can set the popup for multiple objectives at the same time as shown below. 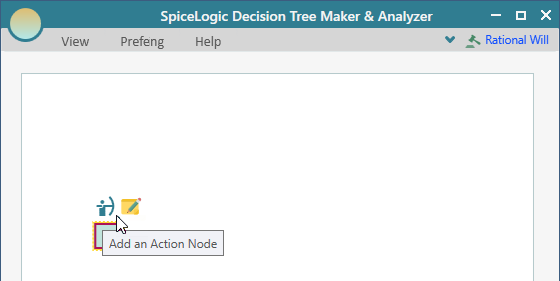 Even though the Parallel Node is not a concept in a standard decision tree, it is an extension from SpiceLogic Decision Tree Software. 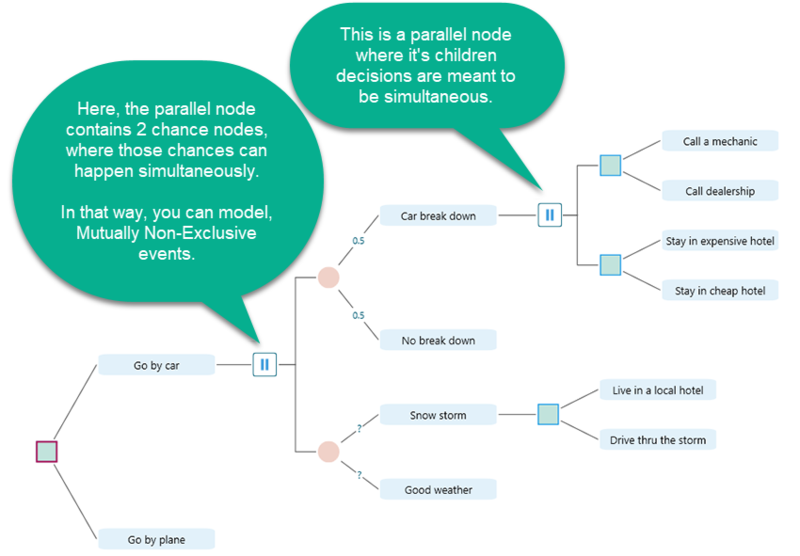 A parallel node is a node where it's children are considered simultaneous decision trees. For example, you may think about 2 decision problem at the same time. Or you may have 2 mutually non-exclusive chance events. Then you can use the parallel node. You can use the Parallel node as the root node by clicking the following button from the start screen. A parallel node can be added to an Action Node or an Event node. You will see the flyover menu button for a parallel node. An action node or an Event node can be terminated by a terminal node. 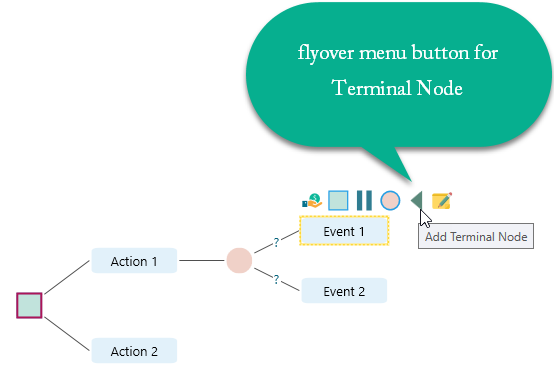 When you select an Action node or Event node, you will see the flyover menu showing Terminal node button. Obviously, a Decision Node or a Chance Node cannot be terminated by a terminal node. Because those nodes can contain only Action / Event as children. Therefore, you will not see the Terminal Node flyover menu option when you select a Decision or a Chance node. Using a Terminal node is optional. A terminal node does not change any calculation logic for the analysis purpose. But, the Terminal node has a very useful benefit. When you add a terminal node, the Total Payoff for that terminal will be displayed by the terminal node.